If goldfish grow to fit the size of their fishbowl, what happens when there is no bowl? That's a question Alberta wildlife experts are starting to answer, and the answer doesn't sound good. Invasive species experts in Alberta are warning people against flushing live goldfish down the toilet, after several specimens the size of dinner plates were pulled from ponds in different areas of the province. Goldfish have been found as far north as Fort McMurray and as far south as Lethbridge, according to Kate Wilson, the province's aquatic invasive species co-ordinator. 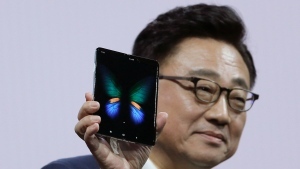 That covers a distance of about 800 kilometres, which has the province's experts concerned. "It really is becoming an issue," Wilson told CTV's Canada AM on Friday. "Once released from your small aquarium, a lot of these species can get quite large because they're not constrained by the size of the tank." More than three dozen goldfish were pulled from a storm pond in Fort McMurray last summer, including some as long as 20 centimetres in size. Wilson says officials found evidence that the fish were breeding and surviving through Fort McMurray's cold winters, which suggests their numbers are growing. "We just really don't want to see them breeding in the wild like this," she said. Invasive species can be potentially devastating for the environment and economy of the areas they invade. The province has already found invasive Prussian carp, and is working to prevent zebra mussels and lampreys. These invasive species could alter the delicate balance of Alberta's aquatic ecosystems, preying upon native fish species or competing with them for food. Wilson says it's unclear at this point what impact the invasive goldfish might have on other species, but their numbers are already a concern. Goldfish can compete with native species for food, and they've also been known to eat fish eggs. Anyone caught flushing live fish or the contents of their home aquarium can be fined up to $100,000 under the Alberta Fisheries Act. Wilson says aquarium flushing can introduce all kinds of invasive species to the ecosystem, including foreign diseases, parasites and non-native plants. She added that flushing your live fish is not a humane way to dispose of it. "It's a really cruel thing to do to a pet," Wilson said. "It will probably die a horrible death, but some of them are so robust that they will survive, and they will actually do potentially huge damage." CORRECTION: A previous version of this article stated that zebra mussels and lampreys had been found in Alberta's waters. That is not the case. Officials have not detected the presence of those species. 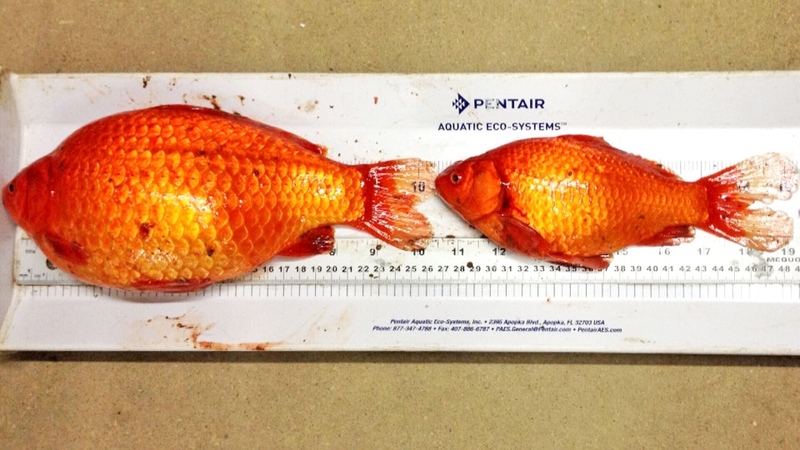 These large goldfish were pulled from a pond in Fort McMurray, Alta. in 2014.